Wanna step up your chip game? These crisps are baked and made from nutritious carrots! There are only two ingredients: carrots and sea salt… No oil at all! Gluten-free, fat-free, and full of fiber, you can eat the whole bag for less than 150 calories. 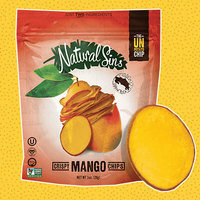 There’s also a Ranch flavor of these all-natural chips! 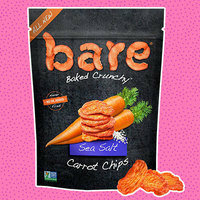 Click to find Bare snacks in stores. And be on the lookout: the Carrot Chips are rolling out now. Time for a schmancy snack find! We've been crazy about ParmCrisps for a while: They’re crunchy high-protein crisps that are practically pure Parmesan cheese! And we LOVE that they've been portion controlled and paired with dried fruits, nuts, and seeds. It’s like deconstructed trail mix with a cheesy spin! 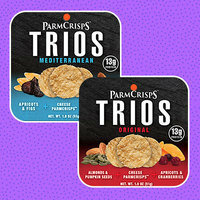 Try all three varieties: Original, Tropical, and Mediterranean. Available nationwide, stocked with the shelf-stable snacks. Happy National Salsa Month (a.k.a. May) everybody! Want your salsa fresh and low in sodium? Make it yourself with this HG-rific recipe!